I’ve recently seen Simon Nye’s 2000 Adaptation of E. Nesbit’s novel “The Railway Children on television again. It is about three Edwardian Children, (played by Jack Blumenau, Clare Thomas & Jemima Rooper), who are forced to leave their London home and move to rural Yorkshire, where they fall on hard times and have a series of adventures. 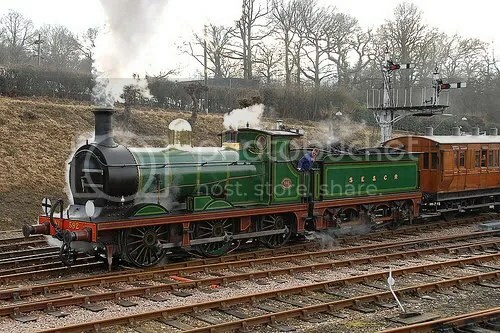 It was filmed at The Bluebell Railway and also Stars Lord Richard Attenborough, Jenny Agutter and Gregor Fisher. Among the wonderful locomotives used in the production were the SECR Class C Wainwright Goods Locomotive no592, The LBSCR Radial Tank locomotive no473 “Birch Grove“, The NBR C Class Locomotive no673 “Maude” and the B4 Class LSWR Tank Engine no 96 “Normandy”.